RUSTED METALS – OSPHO is a rust-inhibiting coating – NOT A PAINT You do not have to remove tight rust. 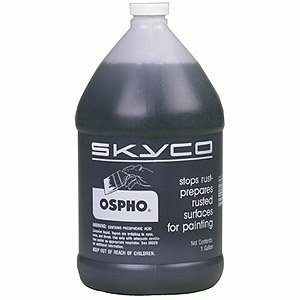 Merely remove loose paint and rust scale, dirt, oil, grease and other accumulations with a wire brush – apply a coat of OSPHO as it comes in the container – let dry overnight, then apply whatever paint system you desire. When applied to rusted surfaces, OSPHO causes iron oxide (rust) to chemically change to iron phosphate – an inert, hard substance that turns the metal black. Where rust is exceedingly heavy, two coats of OSPHO may be necessary to thoroughly penetrate and blacken the surface to be painted. A dry, powdery, grayish-white surface usually develops; this is normal – brush off any loose powder before paint application. NEW METALS – For new ferrous or aluminum metals: remove dirt, grease, or oil; apply OSPHO, let dry overnight, then paint. GALVANIZED – where appearance is important, apply one coat of OSPHO, let stand for approximately thirty minutes or until metal is etched. Flush with water, avoiding damage to adjacent areas; or wipe to a smooth finish, let dry, then paint. Where appearance is not important, one coat of OSPHO is recommended to thoroughly coat and etch the metal. Let stand overnight or until completely dry. Brush off any loose powder before painting. WARNING: OSPHO contains phosphoric acid. KEEP OUT OF REACH OF CHILDREN. If taken internally give large quantities of milk or water. Call physician. Avoid contact with eyes. In case of contact, flush with water. Prolonged exposure to skin may cause irritation – use rubber gloves or other forms of skin protection.